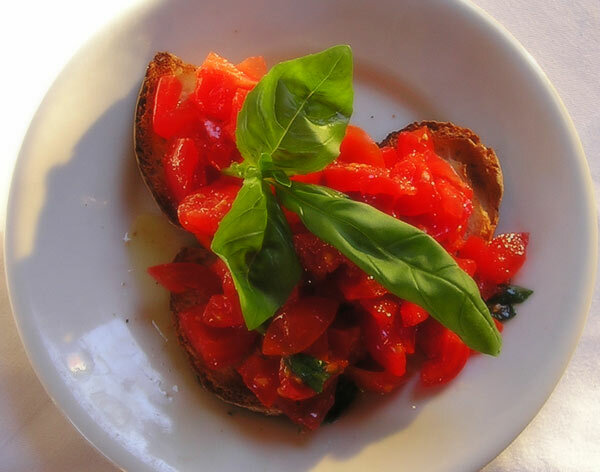 One of the highest expressions of the Mediterranean cuisine, this dish includes some of the best ingredients in the italian culinary tradition such as tomatoes, basil, garlic, bread and olive oil. Cut up the tomatoes in small cubes in a large bowl. Add the oregano, chopped basil, the salt and the oil. Let it rest in the refrigerator for at least 30 minutes. Toast the sliced bread in the oven or on the BBQ until golden and crunchy, pay attention not to burn it. Once done, place abundant tomatoes on it, add some olive oil and some fresh basil leaves. As an option, you could grind part of a garlic clove on the toasted bread surface before adding the tomatoes. Serve immediately or the bread will become soft.